All flats are secure, clean, airy and mosquito proof. They all have their own toilet, shower, wash-hand basin, bathroom cupboard. Bathrooms are wall to wall tiled, with shower curtains. 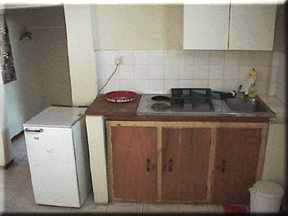 All Studio flats are at the ground floor, size about 30 square meter has small gas cooker. All flats have a double bed with 3 sheets and two pillows, one comfort chair, dining table, two dining chairs (plastic), fridge. Gas cooker with 4 burner and oven for simple cooking. 2 burners in studio flats Kitchenette. Cupboards for storage of kitchenware etc. Cutlery. Generator available at site. Cleaning of flat once a week or on request. All other flats size about 44-45 square meters, with a bedroom and sitting room. These flats contain the same furniture as the studio flats and MORE. 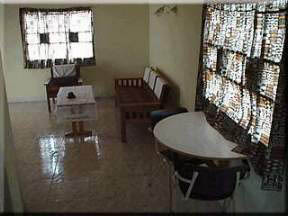 In these flats there are extra comfort chairs, centre table, paintings on the wall and floor rug in all flats. If you would like some drinks put in the fridge, on your arrival, please inform me about what types of drinks you will like. Mary Hardmark, P.O.Box 883, Banjul, The Gambia. West Africa.